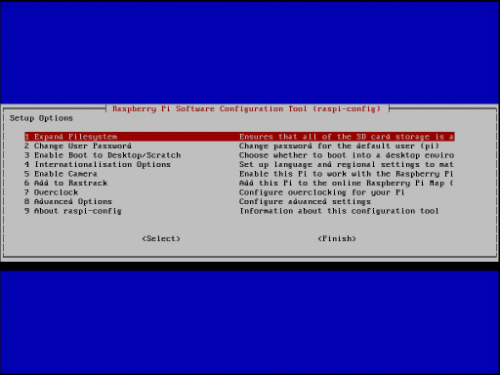 You need only one, but very important command to change important settings in your Raspberry Pi — which is sometimes called changing or setting the configuration. Make sure that you use small letters and not big letters (lowercase not uppercase) and type a minus sign (also known as a hyphen) between the two words. Don’t add any extra spaces or miss adding the space between sudo and the rest of the command. When you type commands at the command line, they have to be 100 percent right. You can’t make any mistakes — no extra letters, no extra spaces, no wrong letters, no big letters when you should use small letters. Otherwise, the Pi won’t understand what you’re trying to do. If you don’t make any mistakes, you see a screen like the one in the following figure. This screen is a menu. It’s like a clumsy and hard-to-use version of the drop-down menus you see in apps on a Mac or a PC. You can’t click on things with your mouse. You have to select them by using the up/down arrow keys on your keyboard. Then you press the Enter key to select them. Try it now. Press the down arrow, and the red bar moves down by one item. Press the up arrow, and it moves up by one item. To access the two lower options — they’re <Select> and <Finish> on this screen, but you’ll see other words on other screens — use the left and right arrows to highlight them. Press Enter to select them. If you didn’t use NOOBS (New Out Of the Box Software) to make Raspbian, select 1 Expand Filesystem first. Press Enter and follow the instructions. The items you see in the Setup options keep changing. You may not see exactly the same list you see here. If you don’t know what something does, leave it alone!